1. Underlying structure: Is the framing underneath sound, and is your deck properly built? Is it safe? There’s no sense in spending six or ten hours or hundreds of dollars to beautify your deck if it may injure you or it may collapse. You can determine quite a lot about your deck by examining it yourself. Most cases if there is a question about whether it is safe, it probably isn’t. 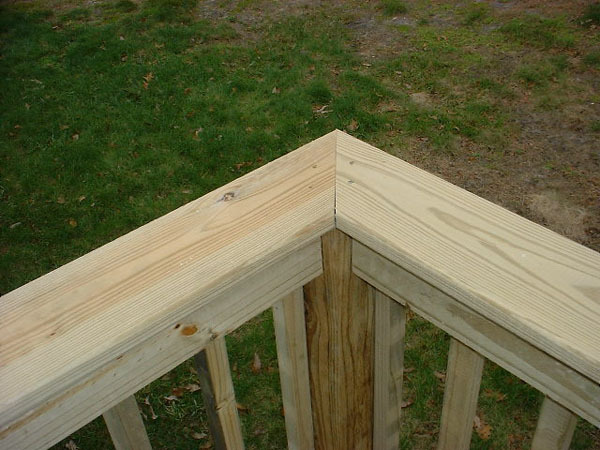 If you are unsure about its framing or suspect your deck may not be safe, get a professional inspection. 3. Appearance: If your looking at decks then your deck has probably faded and may be stained with grease from a grill or have black mold stains. Power washing and re-treating it can dramatically improve your deck’s appearance. But a painted deck presents a greater challenge. Cupped boards are more difficult. If the cup is small and the raised edges are not too high, you can sand it down and use screws to further pull it flat — or you could just live with the small cup. But floorboard edges that are raised high could trip someone. Serious cupped boards require serious tactics. If you can clamp the raised edges down (as on a rail cap), do so, and then screw it flat. Otherwise, consider flipping the board over. The cup will now slope down, and the drying forces that previously cupped the board should now work to straighten your board. The new top side may show significant discoloration that you’ll want to sand or perhaps power wash. It may be easier here to just replace the offensive board. Splits in boards are problematic. We do not recommend filling splits with putty or wood fillers. Despite manufacturers’ enticing claims, even “external wood fillers” will not endure outside with swings of 80% in humidity and 90 degrees in temperature. Remember that “devious and persistent Mother Nature”? Just replace seriously cracked boards. A note about splits vs. checks: Splits extend all the way through a board and weaken it. Checks extend only partially through the wood (1/3 or so). In PT wood, checks are the normal result of the natural drying process. They are most prevalent in larger dimension wood (4×4 rail posts, 6×6 support columns). Despite their size, checks do not weaken the wood. Old, flaking paint can pose a real problem,especially if the paint is thick. For example, cleaning a deck floor like this thoroughly enough for it to look good will take a tedious combination of scraping, chemical stripping, power washing, and sanding. And even then, the results may not prove satisfactory. Better to skip all that work and replace the flooring. So, your deck is structurally sound, and you’ve fixed those troublesome boards and replaced all the loose nails with screws. Your deck has weathered and discolored badly, has some grease stains from the grill and accumulated dirt. Now it is time to clean off the deck floor and brighten the faded wood. Chemical cleaners, a stiff brush, and your elbow grease can be effective. But I’d recommend an alternative that uses plain water instead of harsh chemicals and that trades off scrubbing on your hands and knees for a careful use of a power washing machine from a standing position. (OK, I admit my choice here is influenced by work smarter, not harder.) You can rent a power washer relatively cheaply or buy one for a few hundred dollars. Proper technique is important. Practice on concrete first, then a piece of wood. I’ve had some better success with scrubbing the deck with a simple green, bleach, and vinegar solution before pressure washing. If you use the solution make sure to wear a mask and goggles while pressure washing! The results can be dramatic and amazing. Your deck is now fixed, cleaned and ready for a preservative. Treating your pressure treated deck is not difficult; but again, technique is important. First, select a good wood preservative. I recommend one that includes a semi-transparent stain and is formulated for PT wood. Do not use paint on your deck floor. Let me re-phrase that, lest you misunderstand. NEVER apply paint to an exterior deck floor. Paint is a film that will peel, chip, and flake off. Use a preservative stain — it will soak into the wood and will not flake. I recommend using a semi-transparent rather than solid colored preservative stain. Sure, solid stains come in a wider range of colors, but foot traffic on a deck floor will wear the solid colors unevenly and require more frequent (and complicated) maintenance. Semi-transparent preservatives show the natural wood grain and age more gracefully. The best preservative stain for PT decks that I’ve found over the years is TWP, which stands for “total wood protection”. Use series 200 for PT wood. Do not use clear your deck will not get a tan. Stay away from Pine colors they will react with the pressure treatment and give you an uneven finish. Applying the preservative to your deck requires only a little technique. Follow the instructions on the stain container. Your deck must be totally dry before you treat it. If your deck is structurally sound but all the repairs I’ve described seem like too much work, or if treating your deck every year or 3 seems like too much work, consider renovating it. Remove the wood flooring and rails and install new, low maintenance materials. Keep the frame. The selection of PVC decking and rails available today is excellent. The best products look very natural and are stain resistant, scratch resistant, and mildew resistant; some even offer fade resistant guarantees. There are a large number of manufacturers, and like any other products there are better ones. This beauty and low maintenance advantage comes at a price, however. The new synthetic decking and rail materials (composites) can be three times the cost of PT. But you are re-using your existing deck frame, and the labor to install low maintenance materials is the same as installing high maintenance wood. More importantly: what’s the value of your labor to repair and re-treat your wood deck every year? If your deck has serious structural flaws or you want to change its size or shape, then you’ll have to build a new deck. 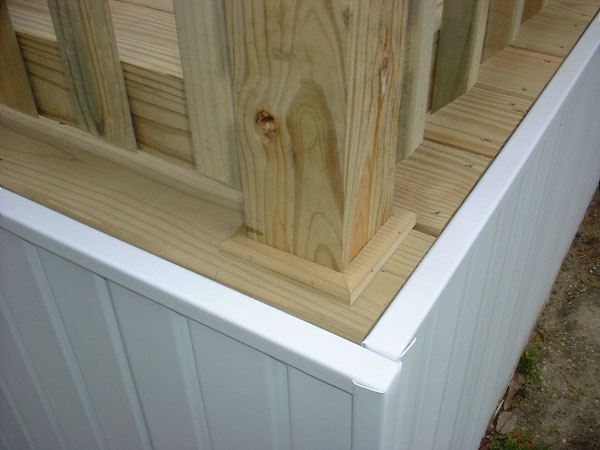 Here your choice is fairly clear: low maintenance decking, rails and trim at a higher initial price or wood with higher long term maintenance. Now CHECK OUT OUR PORTFOLIO! !